Today we meet at the crossroads of theory and practice by putting together and testing the 5V regulator and crowbar circuits we designed back in this article. We're going to cover some of the practical aspects of SMD soldering and some of the "gotchas" that you need to be aware of. It's not crucial to use the exact tools listed above. Some of them are pretty expensive and I had several of them available through work. There are cheaper alternatives to some things like this microscope from Adafruit or this USB oscilloscope from Digilent. The most important tools were the hot air rework station and the solder paste syringe. Another very useful SMD rework tool to have is an industrial hot plate. This lets you get the entire board to a consistent temperature so that you don't have to put excessive heat into the components on the top of the board. The board from OSHPark was ordered with a new option they started offering which was half-thickness FR4 (0.8mm) with double thickness (2 oz. / 70um) copper. This allows better thermal and weight characteristics but increases the capacitance between the top and bottom layers. The first order of business is to use the solder syringe to put a dollop of solder on each surface mount pad. It's pretty straightforward for the resistors and capacitors, but on the voltage regulator, the inductor and DPACK diode pads had a little more solder than is probably necessary. My rationale for this was that since these components are designed with heat dissipation in mind, it's crucial to have a solid thermal connection to the top copper layer. The solder paste on the pads of the LM25576 doesn't have to be perfect and can overlap the pads a bit. The whole idea is that the surface tension of the solder will cause it to stick to the closest pad and lead, and away from the solder mask. Next, using the schematic of the regulator and the crowbar, and the layout files, carefully place the surface mount components on their correct pads paying extra special attention to IC and capacitor polarity. 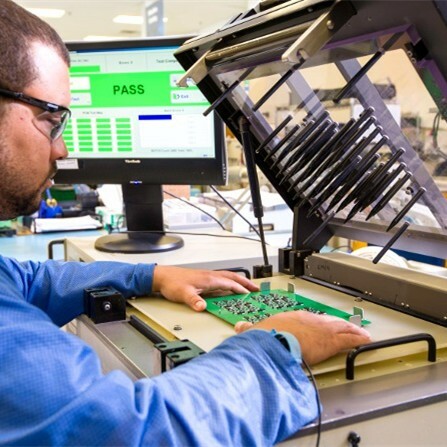 Once you've checked (and double checked) that everything is correct and in place, move on to the next section which uses the hot air reflow station to solder the pieces in place. The idea is to warm everything up to around 150 degrees C and then increase the temperature to about 200 degrees C for a short while. The timing can be a little tricky (which makes having a reflow oven oh so nice!) but for these one-off boards, we can afford a bit of leniency with temperature. Keep in mind that many parts of the board are specifically designed as heat sinks, which is why preheating everything is important for getting everything to reflow properly. This is where the optional hot plate would come in handy. The trace connecting the LM25576 to C9 is very thin compared to the one connected to the diode and its massive copper pour area. This caused the solder to melt first on the small trace's pad and the surface tension pulled the capacitor into its upright position. While annoying, this error can be easily fixed by hand in the next section. NOTE: There was an issue with the DigiKey order where instead of 22uF ceramic output capacitors, I was shipped a batch of 0.22uF capacitors. I left those parts unpopulated in the meantime while I get more in but it may affect voltage ripple during the tests. Now it's time to break out the soldering iron — both to correct mistakes and add the rest of the through-hole components. One of my more problematic areas was the fine-pitch leads on the LM25576. Some of the traces on the chip are connected together on the PCB to allow for higher current to flow, so it's fine if some of the solder transferred up the pins making bridges (see pins 17, 18, and 19 in image above) but on other pins, it could mean letting out the magic smoke when powering on. Use the desoldering wick and a little solder to remove the shorts if any. Now for the through-hole components. The screw terminals and fuse holder require, in addition to a solid electrical connection, a strong mechanical connection to withstand the replacement of fuses and swapping out connector wires. NOTE: On the crowbar layout, it looks like I laid out the fuse clips backward. In order to keep the fuse in the board outline, I attached the fuse clips to the opposite side of the board. That required putting the LED on the opposite side of the board as well. So the boards look fine but it's all for nothing if it doesn't meet spec. As the old saying goes: "the proof is in the pudding". First, we need to test the open circuit output voltage using the bench power supply and an oscilloscope. A multimeter may suffice for DC measurements but it won't show you any transient properties like rise time or voltage ripple. I did find the multimeter very useful for current measurement, however. A current probe for the oscilloscope would have been ideal but, unfortunately, I didn't have one available. Double the ripple but still within 5% under full load (4.8%). Hopefully, the low ESR of the ceramic caps will mitigate some of this when it comes in. In the Wandboard schematic (PDF) it shows several LDO linear regulators that it uses for actually delivering power to the processor. The 5V rail is used more for peripherals like HDMI and USB. If it causes issues, I'll modify the design to include a 5V LDO on the output just to eat some of that ripple. The crowbar is our last line of defense against over voltage and over-current conditions. It's important that the trigger voltage for the TRIAC on the board is set to a level that won't damage the Wandboard processor or additional ICs before it cuts off. The 5V rail is really only used for powering USB and HDMI devices attached to the Wandboard — the processor itself is connected to various other lower-voltage rails achieved through further regulation. Power distribution switches on the board connected to the 5V rail like the TPS2065 (PDF) and TPS2061 (PDF) set the absolute maximum voltage to 6.0V. The onboard 3.3V regulator, the AME8816 (PDF), has a higher max of 8.0V. This means we should absolutely not let the crowbar circuit exceed 6.0V for risk of damaging the other components. According to the scope, it trips almost exactly at 6.0V. It would help me sleep a little better at night if the trip voltage was closer to 5.8V but that can be tweaked easily by adjusting the voltage divider on the crowbar trigger. As it stands, though, this is acceptable for our application. With two of our hardware sub-projects completed which allow us to power the board from batteries, we can now focus on developing the software and mobility platform for C-BISCUIT. The next steps, after getting Linux up and running on the Wandboard, is to install ROS to communicate remotely, simulating the robot in Gazebo, and designing / building the motorized frame to move the land-based version around. Stay tuned for more to come in the following weeks. Until next time, happy hacking.